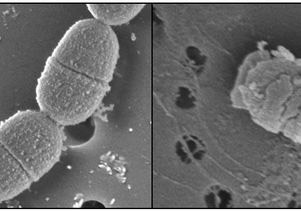 Courtesy of Dr. Wenyuan Shi - S. mutans bacteria, before and after treatment with C16G2. In 2011, UCLA’s Dr. Wenyuan Shi developed a mouthwash that could eliminate the bacteria that is the principal cause of tooth decay. A new study led by Shi, chair of the section of oral biology at the UCLA School of Dentistry, describes more precisely the mechanism that makes the mouthwash’s active ingredient so effective. The research, published in the June issue (PDF) of the Proceedings of the National Academy of Sciences, explains how a specifically targeted antimicrobial peptide, or STAMP, known as C16G2 works to eradicate only the harmful acid-producing Streptococcus mutans bacteria, the main cause of tooth decay, without disturbing the benign and beneficial bacteria in the mouth. The finding is a critical advance because, as scientists have understood for about two decades, the vast majority of bacterial cells in the human mouth are not harmful to our health. Most common broad-spectrum antibiotics and conventional mouthwashes indiscriminately kill both benign and harmful pathogenic organisms, and their effects last for only about 12 hours. In addition, overusing broad-spectrum antibiotics can seriously disrupt the body’s ecological balance, which can make people more susceptible to microbial infections. As a result, there is no effective treatment for bacteria-induced tooth decay. Shi said the STAMP approach would be a unique solution for re-engineering the mouth’s microbiome for long-term health. C16G2, which is now delivered via a gel tray, is being developed for use in preventing tooth decay and cavities under an investigational new drug application with the U.S. Food and Drug Administration by Los Angeles-based C3 Jian, a company Shi founded around patent rights he developed at UCLA. It is currently in Phase 2 clinical trials. A growing number of studies have demonstrated that changes in the composition of our microbiome correlate with numerous disease states. When bacteria cause diseases, it is typically because they grow beyond their normal population size or niche (which can occur when the body’s immune system is compromised), or because microbes enter parts of the body that are normally sterile, such as the blood, lower respiratory tract or abdominal cavity. Because of how the STAMP strategy works, Shi said scientists might also be able to use it to treat and prevent other microbiome-related diseases — meaning it could have an impact far beyond dentistry. The study was supported by the National Institute of Health (grants NIH-1-R01-DE020102 and NIH-1-R01-DE023810-01) and by C3 Jian.